As my partner in crime stated it was a very long winter, but spring has arrived and with it comes fair-weather hiking, fishing and camping. Although the winter allowed me to look forward to summer activities it also allowed me to reflect upon the events of this past fall – or more specifically, my 2013 moose hunt. We arrived on the crown access road at daybreak and began the tedious chore of lugging four days worth of gear into our campsite. Hauling the gear in to the camp from the truck took all morning. We set up a tent for gear storage and completed finall touches to our lean-to shelter. Thankfully, Dad brought along his chainsaw to finish gathering firewood – since my attempts were cut short earlier in the month. By mind afternoon we were settled into our home away from home. The plan for our evening hunt was to head into the spot where I saw a bull earlier in the season. We hoped to nestle ourselves into a perch overlooking a woodland clearing with significant moose activity.I loaded my Remington 7600 Carbine with some Hornady brand 165 grain .308 Winchester rounds as we entered the park on foot. We made our way into the spot and found an opening on a nearby ridge overlooking the area. Dad devised a strategy to call from an alternate location behind me – further up the ridge – in hopes of luring a moose into the opening below us. Several calling sequences and a few hours later we began to get impatient and decided to explore the area for fresh signs. We slowly stalked through the forest on an old trail between two ponds looking for a better vantage point without success. As the sun began to set, we decided to head back to camp to settle in for the evening – and plan our next day’s hunt. We arose before daybreak to cold temperatures – around -5°C – and an October snowstorm was pounding down on the tarp above our heads. 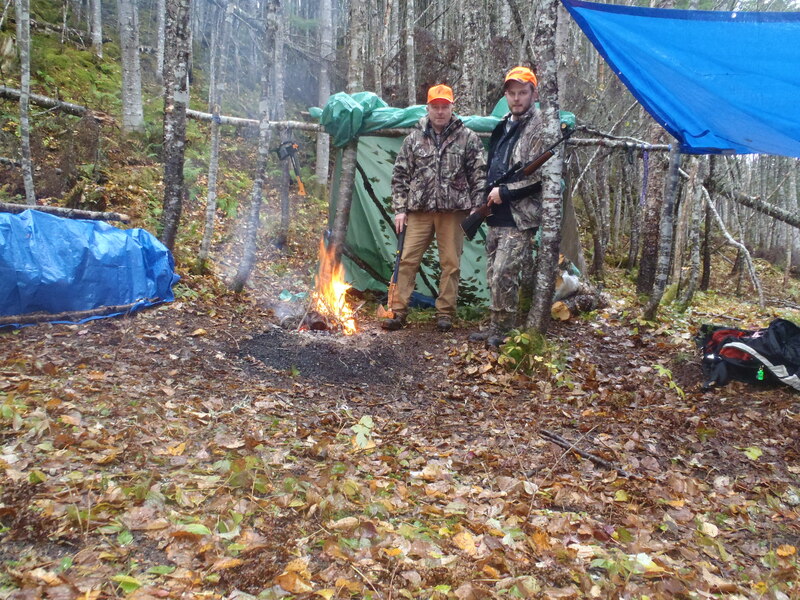 We stirred up our fire, had a cup of tea, and struck out for the morning hunt. I had spotted a place along the park boundary where I could see a good distance and planned to put my chair there for the day. Welcome to Newfoundland in October! 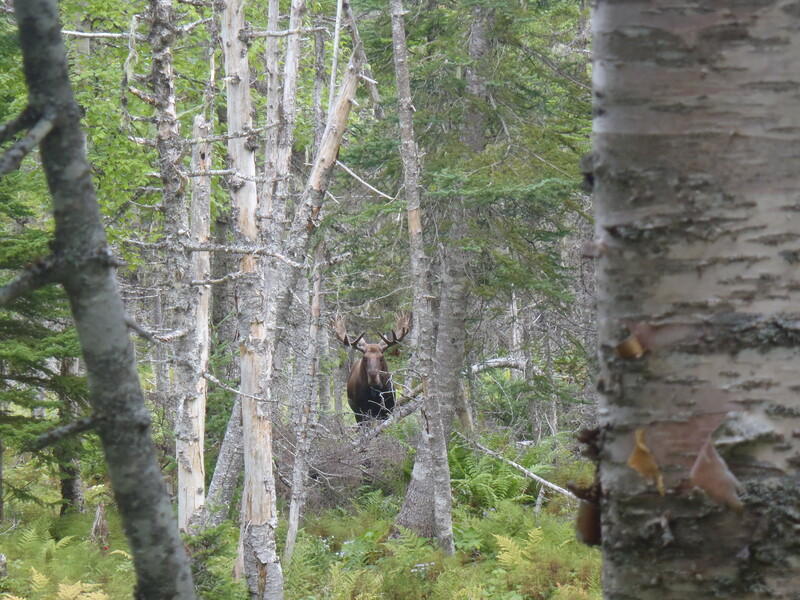 I would like to tell you a harrowing story of stalking moose all over the hills and valleys of western Newfoundland, but our days mostly consisted of sitting in different locations and trying to call moose into view. 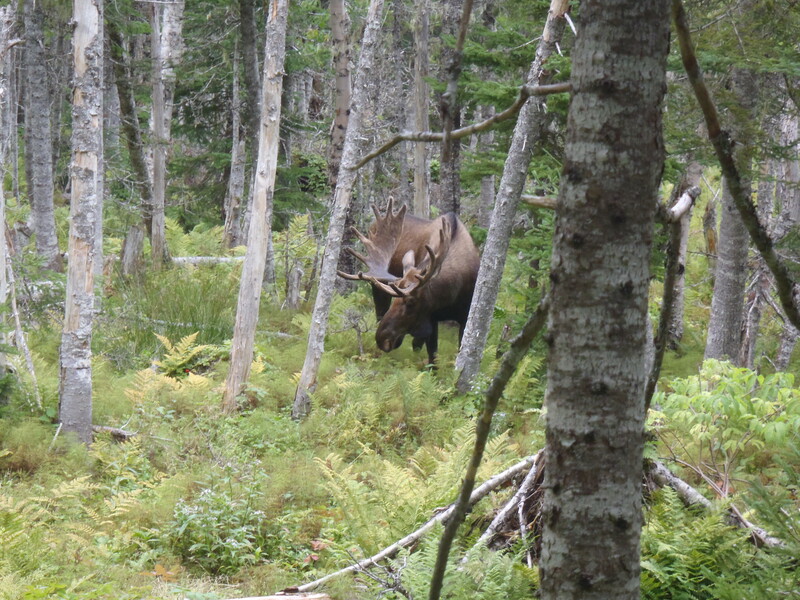 The difficulty with hunting moose in the forest like this is that moose have excellent hearing and trying to sneak up on one is next to impossible. 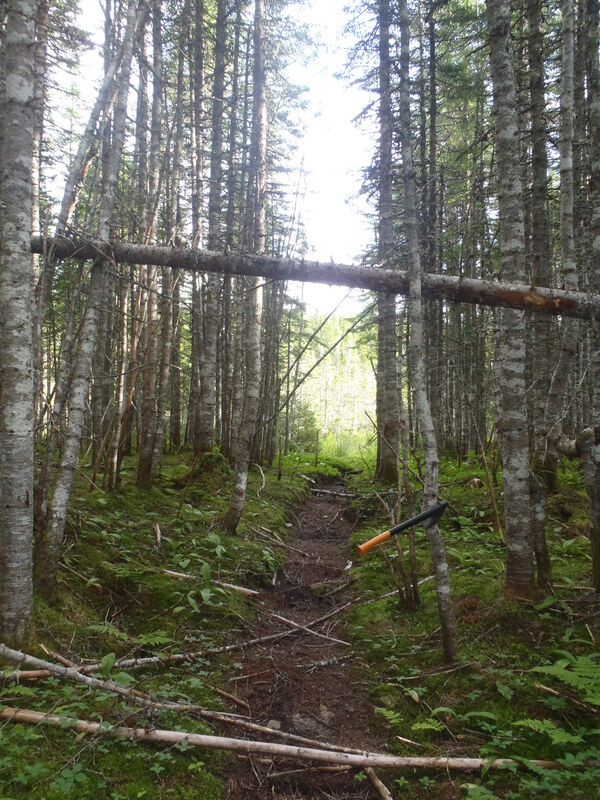 Our best chance in this terrain was to set up on natural pinch points with established moose trails and use that hearing to our advantage – by calling. As our fourth and final day arrived, we reflected on our time that week. It had been one year since I left New Brunswick, and this was the most time my dad and I had spent together in many years. We shared stories, good meals cooked on the Coleman stove, and even a cold pop or two. We reminded each other that the definition of a successful hunt is relative. The hunt it isn’t always about the kill, it’s about time spent in the outdoors becoming a better person and staying connected with those things that are most important to us. We gave it one final shot the morning before we broke camp but returned to Corner Brook empty handed to spend some time with my mother who also made the trip. November and December came and went without much action on the hunting front. I had begun a new role at work that required much more of my time and energy than I originally had hoped for. 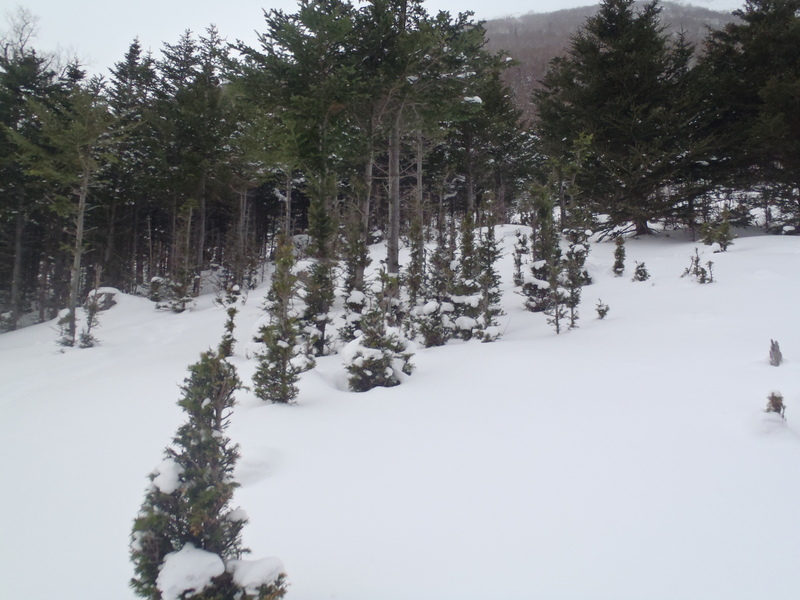 With a record snowfall in December – precipitation on 29 of 31 days – my hunting area became inaccessible. After I returned from New Brunswick at Christmas I had three weekends of hunting time remaining. I adjusted my strategy, rather than finding signs in a location and exploiting that area consistently I decided to look for fresh signs and hunt that area on that day – I was using the snow to my advantage. 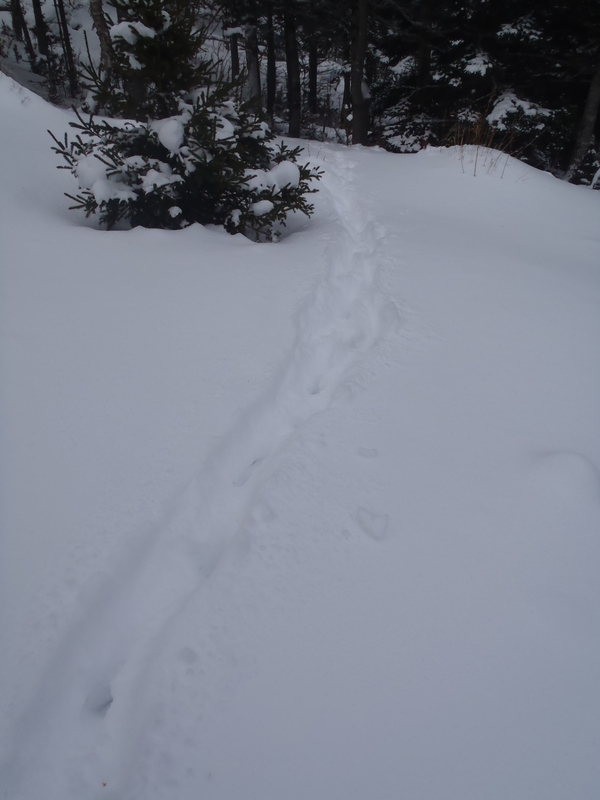 The strategy was reactionary; I intended to follow the fresh tracks , which would allow me to cover a lot more ground. I also watched the weather closely to ensure fresh snowfall for tracking. On the evening before the second last day of the season I watched as the stars disappeared behind clouds and checked the forecast for Gros Morne. I went to bed knowing tomorrow could be the day I finally settle the crosshairs on my first moose. I awoke to fresh snow at the house. I threw my snowshoes, backpack and rifle in the truck and headed out. I drove the 430 highway going through the park before daylight – and more importantly – before snowplows had removed the dusting of snow we had received during the night. I arrived at a wide out parking spot in the park with access to a power-line that paralleled the road for several kilometers. A buddy of mine had successfully harvested his moose a month earlier along this section of line, and I hoped to find fresh tracks. As I was preparing my gear – to my dismay – a convoy of several vehicles transporting a group of cross country skiers parked behind me and greeted me with well wishes on my snowshoe outing. My chances of seeing a moose along the power line with these folks travelling on it were slim. Not wanting to make anyone uncomfortable by toting a rifle around the area – I opted to move to another location. 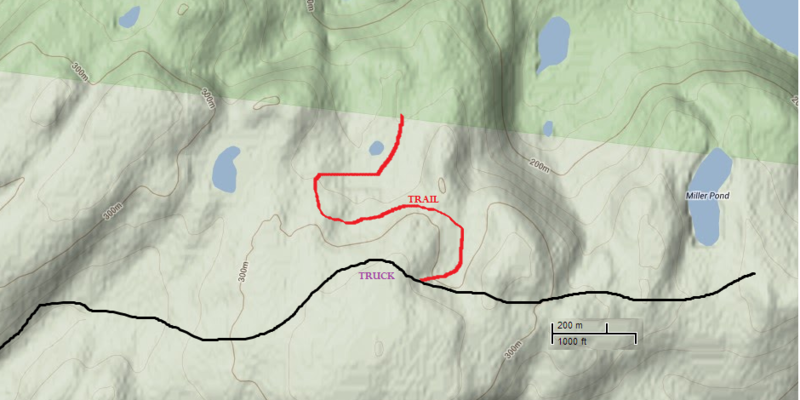 I cut my first set of tracks only a few kilometers beyond the power line access trail. I found a place to park, strapped on my snowshoes and struck out after tracks that I knew could be no more than 3 hours old. I traversed the hillside until I came across the tracks and began the exciting task of chasing a moose deep into the hills. As I was following the tracks I was constantly scanning ahead. I was certain that at any second I would see black fur silhouetted against the snow. I carefully climbed, crawled and pushed my way up the hill. The tracks I was following led me through vast expanses of hillside meadows and stunted balsam fir. This sight reminded me as to why I was even allowed to be doing this in the first place. I crossed two additional sets of tracks heading off in other directions that were hard to ignore, but I pushed on. I was slowly realizing that the prospects of catching up to this moose were slim, and just then the tracks were joined with two sets of coyote tracks -my pursuit was over. I had followed the tracks deep into the country, and after following some additional sets of tracks, I decided to return to the truck. My season was over. I had covered a lot of ground and seen a lot of country. 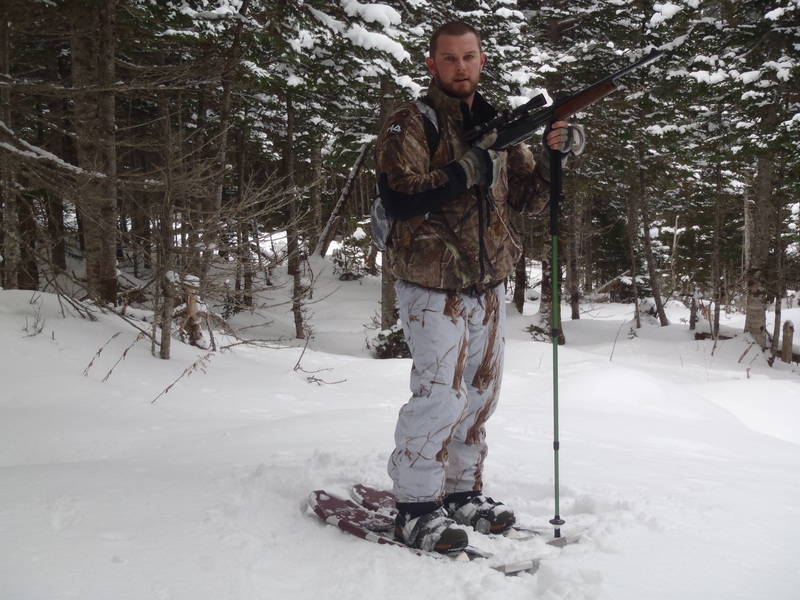 I learned that on snowshoes after a fresh snowfall is a very exciting way to hunt. I saw first-hand how important population control is. 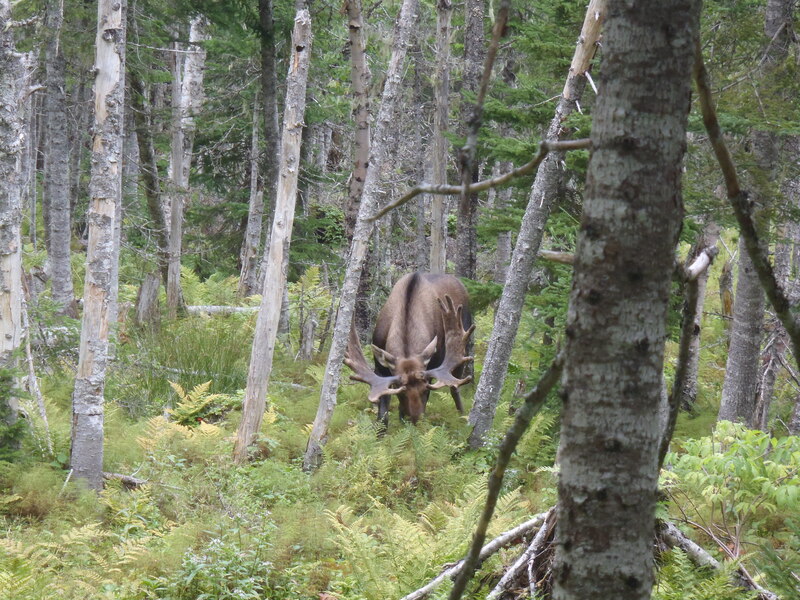 However, -most importantly – I had a new respect for this wild creature of Newfoundland that has adapted and excelled after being introduced here ten decades earlier. I guess there is always next year! Editor Note: At time of Publishing Matt found out he was successful in drawing a tag for Gros Morne again this season! My third trip to the area came on the long weekend in October while most folks were at home enjoying their turkey dinner. Hard to believe it had been two months since my first site visit. On this trip, I brought along my axe, rope and tarps in order to establish camp for the beginning of the season and, the arrival of my father the following week. Hard to believe that my first Newfoundland Moose hunt was really about to begin! My strategy was to use my tarps to build a lean-to that could house me for up to a week. After arriving at the site, I selected two, appropriately spaced, strong looking trees for use as the shelter’s vertical supports. I quickly scanned the canopy directly above for potential widow makers, and decided that this was the spot. I moved onto the task of acquiring the main horizontal support beam and three angled supports. The angled supports were for a little extra support – snow was not out of the question. For the beam I brought down a dead, but strong birch tree with my axe and lashed it tightly with paracord to the vertical supports. 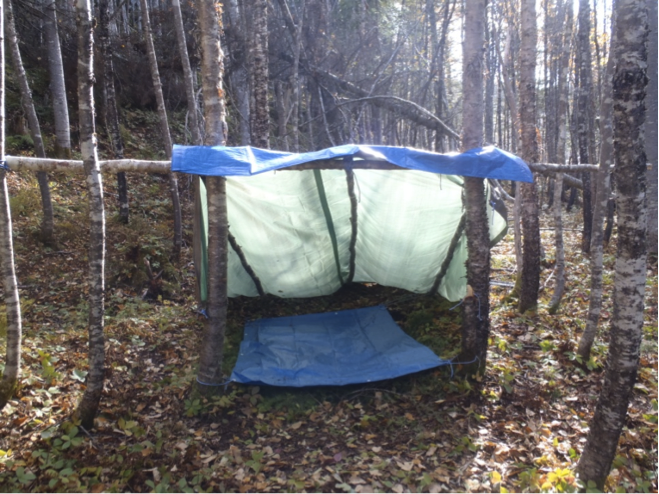 I gathered the three angled supports, lashed them to the beam, and secured the tarp – it almost looked habitable. For the floor, I gathered boughs of balsam fir and placed them upside down for maximum support and comfort. Finally, I covered the boughs with a smaller tarp to provide extra insulation and keep me off of the cold October ground. With the shelter complete, I began collecting wood. 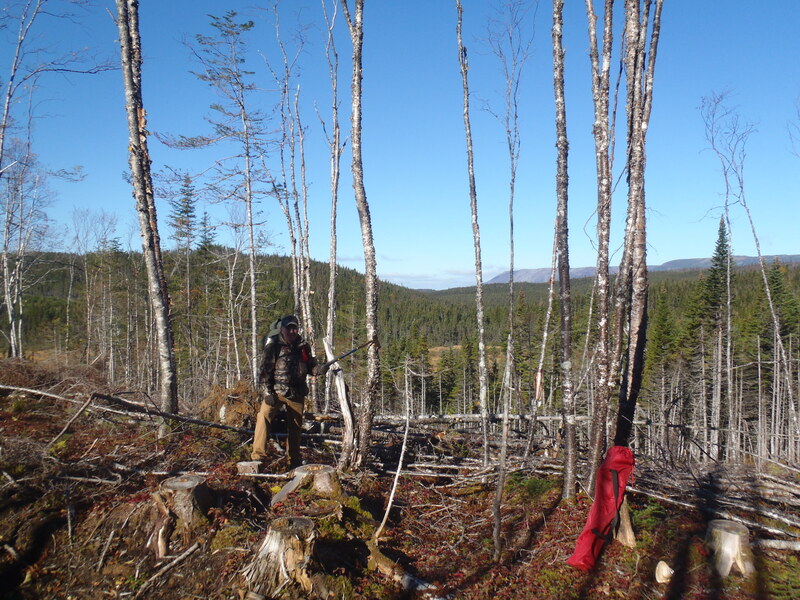 The area was full of dead, standing birch trees ideal for firewood. Standing deadwood is always preferred; by standing it remains dry, as opposed to downed logs, which absorb moisture from the forest floor. I was felling and bucking these trees into four-foot sections and stacking them under a second tarp. I planned to cut these pieces in half with a saw at a later date. After piling a respectable amount of wood, I decided a few more logs would be sufficient. On what was to become my final tree, I made two upward strokes and noticed movement in the tree’s top. I’d seen enough workplace health and safety videos to know that it only takes a small branch at 30-40ft to do some serious damage. Not wanting to be struck in the head with a widow-maker, I focused on the treetop while performing my first downward stroke. That momentary lapse in concentration was all it took; my stroke glanced off of the tree almost as suddenly I felt it strike my left leg. I dropped the axe to the ground, pulled up my pant leg and to my horror realized I could see my shinbone and the supporting tendon. If in the best of situations, this was a horrific injury my situation was devastating. 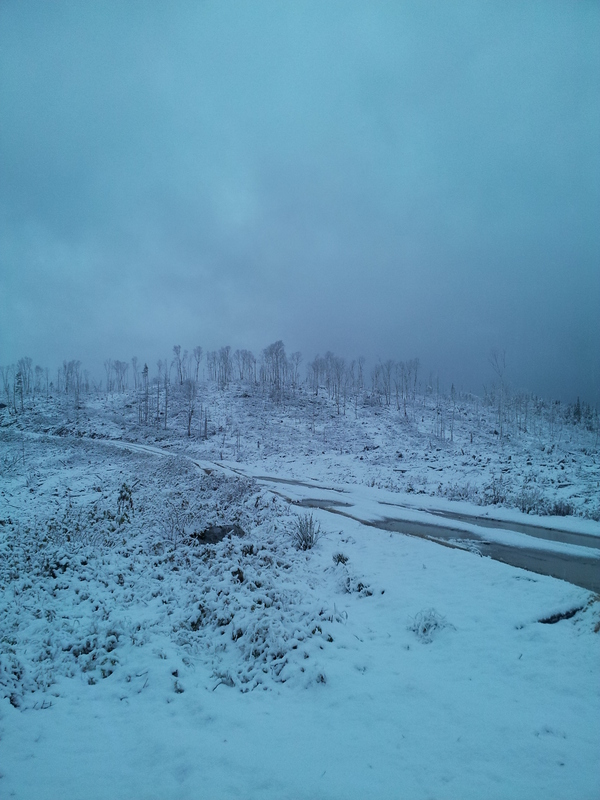 I was one kilometer from my truck through thick woods and over rough terrain. Fortunately for me, my fiancée decided to come along for the trip. Unfortunately for her – so she soon found out – she doesn’t deal well with the sight of blood or grotesque injuries. The moments following the axe injury were – as you can imagine – hectic and rushed. 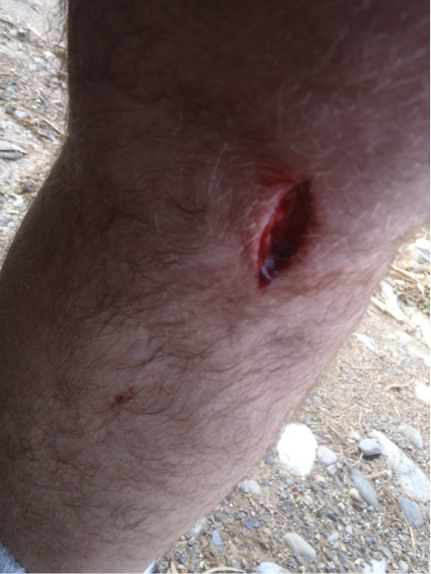 While staring at a gaping hole in my leg, I attempted to recall my first-aid training. I ripped apart a t-shirt I found in my bag and wrapped it around the cut to hold the wound together and apply pressure to slow the bleeding. Danielle gathered up our supplies and started rushing towards the truck while I started hobbling behind her. Up until this point I had been running on pure adrenaline, but as I stumbled over the rough terrain the pain began to hit. I spent the first 200 meters swinging the axe at anything that looked like it had walking stick potential, ultimately finding a strong length of birch. Over the next 400 meters my adrenaline levels evaporated and my pain receptors sharply reminded me of my stupidity. I had a moment of uncontrollable breathing when I began to wonder if I was going to make it to the road. After a few gulps of water I fought my way up the final hill to the road level. With the truck in view, Danielle started running despite my attempts to tell her that if she didn’t slow down she was going to hurt herself. As I crept over the final few yards, I heard a splash and a faint cry. I looked up the road to see Danielle face down in a puddle trying to pick herself up without me noticing. Under less strenuous conditions I would probably give her an earful for having not listened to my warnings. However, these were tumultuous times. When she pulled the truck up I saw she was covered in mud and so was the inside of my truck! I attempted an “I told you so” but it was disregarded as she reminded me that I was not in a position to be arguing. Apparently there were more pressing matters, like the 1.5 hours drive to the hospital. I had one thing I needed to do first, take a picture of my leg for the blog! After an uncomfortable drive – for the length of which Danielle drove like a bat out of hell — we made it the hospital. After several heavy gauge stitches and a few x-rays, the doctor informed me I was one lucky man. I had barely caused any damage to anything but the skin and flesh – my beautiful knee. I got away with a slightly nicked the tendon – the one that supports the foot – and a slight depression in my tibia. However, nothing was damaged to the point that time wouldn’t heal it. Only one thing was certain, I needed to heal fast, moose season opened in a week! Injury or not, I was going hunting!